Is your website a bit tired? 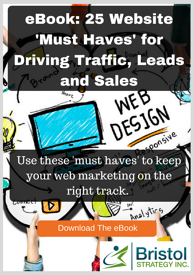 If so, please downloading the 25 'Must Haves' to assess strategies and tactics to bring your website up to date so it is performing at its best for your business. After all, if no one can find your website, all of your efforts are wasted. This chapter covers the importance of content and organization as well as SEO tips to ensure your site is discovered. Consider the experience your website visitor receives when they visit your website! If the organization and experience is poor, then the visitor may get frustrated and move away from your site and onto others. Be sure the flow of your site is optimized and clear. Content is the fuel that drives engagement and helps search engines to find your website. This is so critically important that we cannot emphasize this important point enough. Invest in a content strategy as well to ensure your content answers the questions that your visitors crave. Not only is converting visitors into leads the whole point of a website, it is the most under invested area of digital marketing. CRO or Conversion Rate Optimization is an art that increases the number of leads your website generates. What's more, businesses should also pay particular attention to the conversion paths the visitor takes to convert into a lead. Learn why conversions are important. Pulling it all together, this summary provides an outline for your work. Don't forget that if you need help with any element of your website design you can always reach out to us. Use these 25 'Must Haves' as a guidepost to keep your marketing programs on the right track. Even if you implement a subset of these website tips, it will be well worth it!